I almost didn't buy this book because I didn't like the cover. However, Jill is one of my Facebook friends, and the back cover copy intrigued me. I'm so glad I didn't judge the book by its cover. Desiree "Desi" Jacobs owns a security company. When a museum protected by her firm is robbed, she's not a happy camper. Her friend's sister disappears and is a suspect in the theft of Indian artifacts. Desi finds herself up to her neck in trouble. Her boyfriend, FBI Agent Tony Lucano, worries about her amateur sleuthing. He knows how fast situations become life-threatening. When Desi's investigation collides with one of Tony's cases, the sparks really fly. Desi and Tony rely on God to direct their paths and bring down the shadowy enemies that threaten to destroy their lives and those of many innocent people. Usually, I have trouble putting a book down. This book was so scary in spots, I HAD to put it down. Jill Elizabeth Nelson brings the story to a rip-roaring climax. 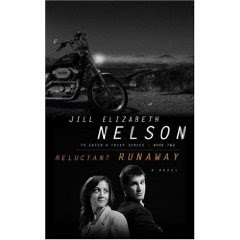 If you enjoy stories about unusual occupations, mystery, and intrigue, you'll love, "Reluctant Runaway." I was just getting ready to search out a new thriller book and your recommendation hit the top of my list. Can't wait to read it! Looking forward to more of your recommendations as they are always good reads. Wow, that sounds like a great read! I think this is an example of how a relationship took priority over your first impression of the cover. I'm glad you listened to the prompting of the Lord. Bet Jill is glad, too! Thanks for the reminder. I need to let Jill know I read and reviewed her book. Even though we're Facebook friends, we haven't had a lot of contact. Thanks for the compliment about my recommendations. 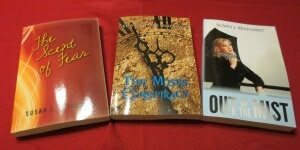 I try to find a good cross section of quality books that stay true to Christian principles. Oooh!!! This sounds just like the kind of book I love to read! Hi, Everyone. Thanks so much for your enthusiasm about my book. And special thanks to Susan for the lovely review. Anyone interested can check out the rest of my titles (including two others with Desi and Tony) at http://www.jillelizabethnelson.com. Thanks for stopping in and for a great read. You sure kept Desi in a lot of trouble! I love Jill's Reluctant series, they are keepers on my bookshelf! Thanks for echoing my sentiments. Jill is a talented writer.